While we often hear about vaccinations, spay-and-neuter policies, and nutrition as being of chief importance for pets in America, one of the most dangerous areas that regularly gets overlooked is dental care for pets. Feline and canine dental care should be a part of any approach to veterinary care in Massachusetts, as periodontal disease is one of the most common diseases that affect pets in this country. While diet and general veterinary care do play a factor, advanced dentistry in Dartmouth is sometimes required. Could your pet be suffering from dental problems? Studies show that 70-80 percent of all cats and dogs in the United States will have some degree of dental disease by the time that they are just three years of age. The best way to help your pet, regardless of the situation, is to start with a professional exam and check-up at your trusted veterinary clinic. Quality veterinary care in Massachusetts can be found at Anchor Animal Hospital in Dartmouth. Since 1975, our team has provided quality veterinary services, including dental care for pets. 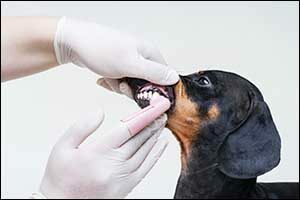 We can provide you with a thorough exam that will help you determine your pet’s dental health. Our veterinary team can offer helpful suggestions and treatment options designed to maximize your pet’s oral health and prevent further decay or disease from affecting them throughout their lifetime. Veterinary experts recommend that you brush your cat’s or dog’s teeth at home to help delay the development of plaque. Unfortunately, some pets really make this difficult and refuse to cooperate with at-home teeth cleaning. In that case, professional dental cleanings may be required once or twice each year to help maintain healthy teeth and gums for cats and dogs. Before you give up on brushing your pet’s teeth, ask our team for tips that might help to make this easier. Once you are able to get your pet to allow brushing, stick with it so it becomes a part of your daily routine. Even if your pet allows brushing, an annual cleaning will be required to provide a more thorough evaluation of dental health, along with cleaning, polishing, and fluoride treatment of the teeth. Feline and canine dental care is offered at Anchor Animal Hospital. Your pet will need to be put under anesthesia to ensure their safety. Our team uses a state-of-the-art multi-parameter machine, which tracks the heart and respiratory rates, end-tidal CO2, oxygen saturation, blood pressure, and temperature of your pet. Each pet is also closely watched by the doctor and one of our highly-trained team members. If your pet has not had dental care previously and dental disease is discovered, such as gingivitis, tartar, mobility issues, and other pathology, we can take it to the next level to provide comprehensive veterinary care in Massachusetts. Digital radiographs are recommended for each dental procedure to determine the sub-gingival health of your pet’s teeth. Approximately 70 percent of each tooth exists below the gum line, making it impossible to see with a simple visual inspection. If your pet has teeth that are unhealthy or diseased, which need to be removed or taken care of, we have all of the tools, equipment, and training necessary to improve their overall health. In addition to extractions and other advanced dentistry in Dartmouth at Anchor Animal Hospital, we also offer laser therapy treatments to provide additional dental care for pets. Laser therapy is used to reduce pain and slow or reverse painful gingivitis. It can even be used after a dental procedure or as part of a monthly maintenance treatment to slow the formation of tartar and other types of periodontal disease. Speak with your vet about advanced dental care for pets to find out if it is right for your pet’s situation. If you are interested in scheduling an exam or service to provide dental care for pets, contact our team by calling 508-996-3731. We can answer any questions that you might have about dental or veterinary care in Massachusetts, schedule appointments or provide details about the services available at Anchor Animal Hospital. Call today and see for yourself why so many pet owners in the Southcoast area bring their pets to our veterinary hospital for routine care and emergency services.